A few months ago we spotlighted a unique custom designed by Karen Turner of Flights of Fancy Design. 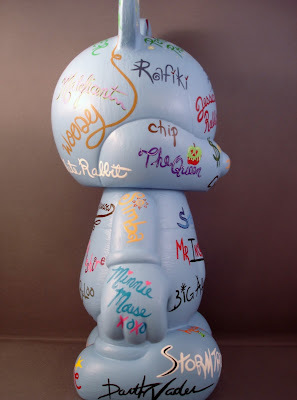 The custom featured hand painted signatures of Disney characters on a 9″ CYO. As someone who takes a vinyl around to collect character autographs in the parks each year on his birthday, this idea immediately hit home to me. And while the experience of actually meeting the characters, getting pictures and seeing how they sign is all part of the fun there is a certain element of style missing. Not to mention there are a slew of movie characters who are not meetable at the Parks. 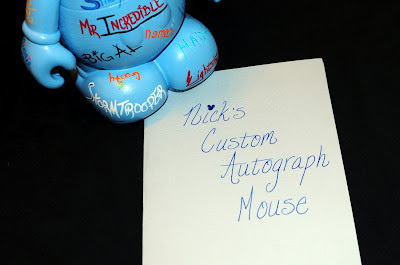 With Karen’s line of Custom Autograph Mouse vinyls, each and every signature is a piece of art in and of themselves. Bursting with color and style. It was not surprising to hear that these sold very well to the Disney and Vinylmation collectors out there. 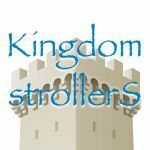 Because of the success, Karen recently contacted us to let us know she has launched three new “themed” versions of this custom: Princesses & Heroines, Princes & Heroes, and Villains & Evil Doers. 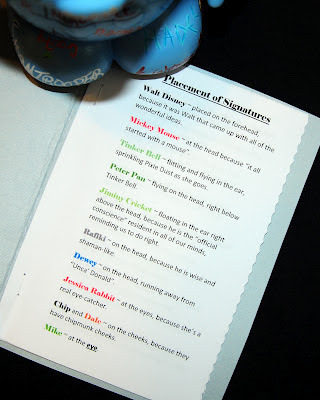 We had the chance to ask Karen a few questions about these customs, but first, I wanted to share some pictures of the sample she sent to DV that included a mix of autographs from all across the Disney universe. All the autographs have been carefully thought out, in both style and location. The come to have a character all their own and that makes this custom a special treat for fans. Figment has horns. Woody looks like a lasso. The Evil Quenn has a poison apple. 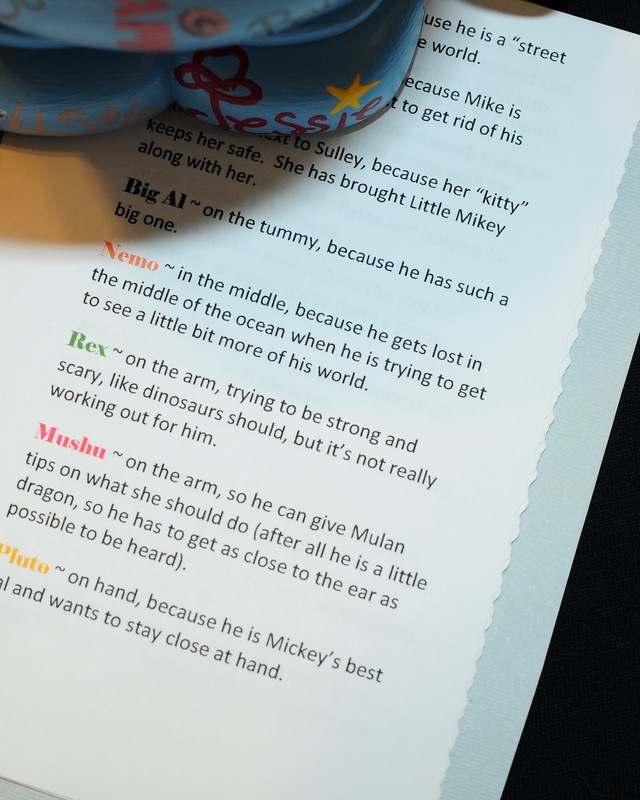 Even the characters that do not sign have a special touch such as Lightning McQueen’s 95 and Kaa’s eyes. 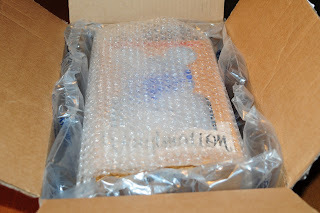 The packaging was extremely professional. A 9″ CYO box was found securely snug in bubble wrap and packing bubbles. 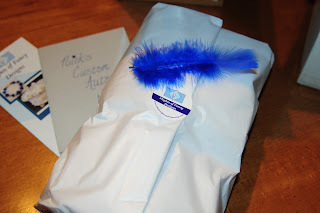 Through the window you could see the wrapping that surrounded the custom within… all topped off with a blue feather (the signature logo for Flights of Fancy Designs). 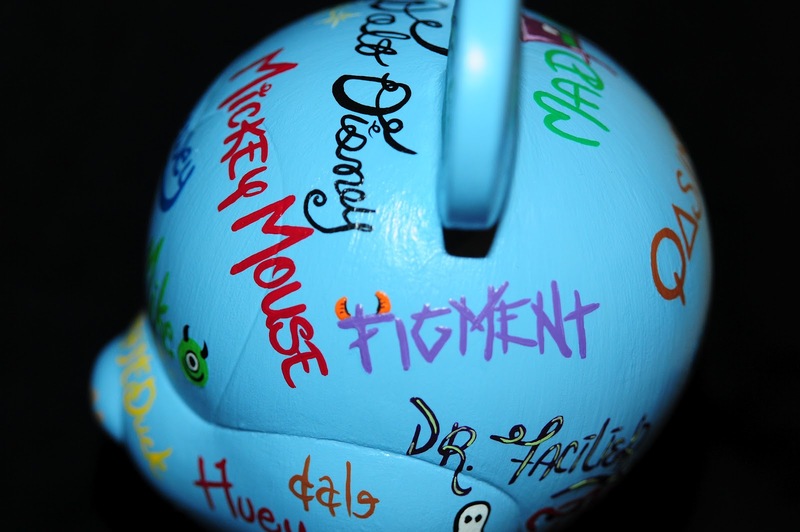 Destination Vinylmation: What was your inspiration to create the 9″ Custom Autograph Mouse? Karen: Well, I had seen pics where people had had their 9″ Vinylmations signed by the different characters at the parks. But, a lot of people said the signatures smudged. So I was thinking what a neat idea if one could figure out how to get the signatures not to smudge. 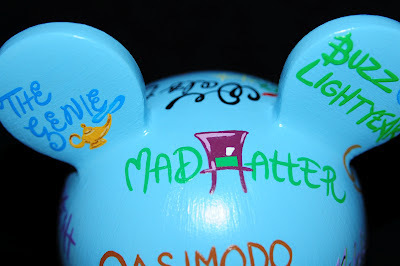 Then as I was thinking about it I starting thinking about the signatures I would want and a lot of them were of characters that aren’t at the parks often – like Lilo or Br’er Rabbit (or at all – Like Nemo or Jessica Rabbit or Pumbaa and Timon). So it didn’t take long for me to go from that thought to the idea of painting the signatures I wanted onto a 9″. DV: How many character signatures do you have available? And are the customs fully customizable with character autographs the buyer chooses? Karen: These are fully customizable. I have had customers give me a list of characters they wanted (one was all Pixar characters) and others tell me they want one like in the picture, but to put Peter Pan at the heart because he is their favorite or to put a character right at the top because it is their favorite. I always ask if there is any particular placement of the signatures that the customer would like – which are their very favorites – so I can be sure to get them in a really good spot. Right now I have 232 character signatures available. I use the signatures the real characters give in the Parks but for the others (for the ones that don’t appear in the Parks) I can always figure out what a characters signature would look like. I have had to do that on several occasions – so my list of character signatures is always growing!! 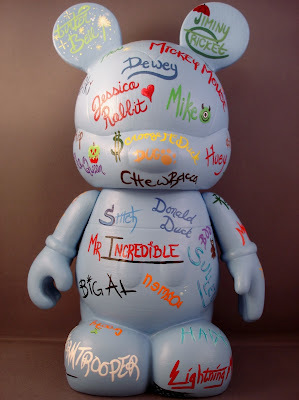 I can fit 70 signatures on a 9″ Vinylmation. 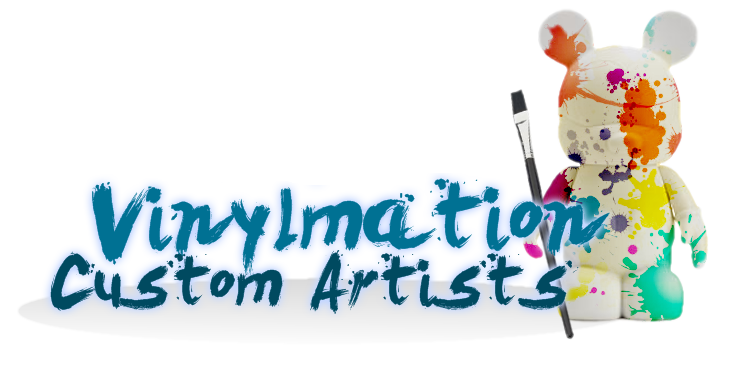 DV: Tell us about your new themed Custom Autographed Mice. Karen: I came up with the idea when I was at WDW with my family over New Years. My youngest niece was (and still is) on a Princess kick. Anything Princess was for her. I figured that she was not the only one like that so I decided to come up with some themed Vinylmations to suit such tastes. One for the girls – Princesses and Heroines. One for the boys – Princes and Heroes. And one for the Villain lovers (which after collecting pins for many years, I happen to know there are a lot of villain lovers out there!!) – Villains and Evil Doers. Once I came up with the different themes, it was really just a matter of making lists of who should go on which figure. DV: It’s the extra touches that make this at truly special item… such as the packaging and signature booklets. Are those booklets included with each custom? Karen: Yes they are. I feel they kind of add an extra bit of whimsy, which to me is what Disney always offers. The little things you find as you are walking down Main Street, the hidden Mickeys in the parks… Those little touches add a little bit of magic to my visits to the Parks, and that what I try to give with the booklets – little funny reasons why this signature is placed where it is – just an extra bit of the magic. DV: You can also tell you really took the time to make sure the custom is secure while shipping. Karen: These guys take a long time to make, so I am always really careful to package them super good. The wax paper wrap is to protect the paint and sealer. To make sure nothing gets stuck to the figure that might ruin it. I have been packing hand painted ceramics that we have for the holidays like this for years and they all come out each year looking fresh and new. 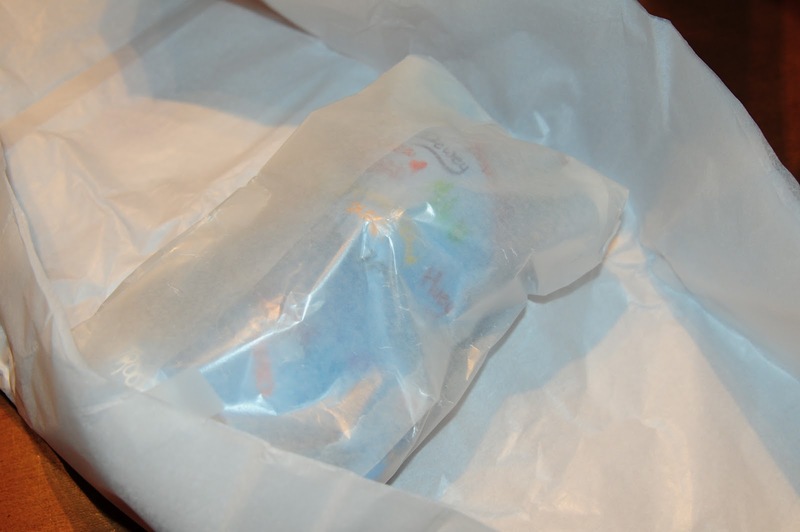 And that’s what I want my customer to have when they get their Custom Vinylmation – one that is as perfect when they open it as when I wrapped it up for them!! DV: How much is one of your Custom Autographed Mouse vinyls? Is there a pricing structure based on how many or what signitures are desired? Karen: All the Autograph Vinylmations are the same price – $86.00. Mainly because it’s as much work to figure out where to put 30 signatures as is for 60 signatures. So customers should order as many signatures as they want – the price is the same no matter. Before Christmas, my wife had me make a list of all of my favorite Disney characters. It was such a thrill to open it Christmas morning. I display it with the booklet open and the vinyl in front of it. I love the signatures, but it is all the small artwork that she takes the time to put with them that truly make this a special piece. Keep up the great work Karen!!!!!! How much for the villain one? How much for the blue one? It says in the article that 9″ Custom Signatures are $86. However the blue one was originally made for Nick, but I guess you could have a similar version. Hi MAAT, All the 9″ Autograph Vinylmations are $86.00. Ed, I am so glad you are so happy with your Custom Vinylmation!! Your wife was Really excited about getting it for you for Christmas!! It is so awesome to know that my work is appreciated by others and that people like it enough to want to have it in their own homes. Thanks so much for you kind words!! Just an update – I now have 233 signatures available – Fillmore from Cars has been added to the list!! There are now 302 signatures available including characters from “Wreck It Ralph” and “Frozen”.